Ardennes, or Ardennais, horses are a multi-talented horse commonly used in endurance riding, general riding, and work activities. They are one of the oldest breeds of draft horse, and originate from the Ardennes area in Belgium, Luxembourg, and France. Their history reaches back to Ancient Rome, and throughout the years blood from several other breeds has been added to the Ardennes, although only the Belgian breed had any significant impact. They are a direct descendant of the pre-historic horses whose remains were found at Solutre; primitive features such as the skeletal formation of the head, with its distinctive, squared-off nose, are still evident in the modern breed. Ardennais horses were known to both Julius Caesar and the Greek historian Herodotus, who praised them for their hardiness and stamina. Originally small, broad-bodied draught horses, Ardennais horses undoubtedly formed the basis for the great horses of the Middle Ages. The first Ardennes horses were imported to the United States in the early 20th century, and the first breed registry was established in Europe in 1929. They have been used throughout history as war horses, both as cavalry mounts and to draw artillery, and are used today mainly for heavy draft and farm work, meat production, and competitive driving events. 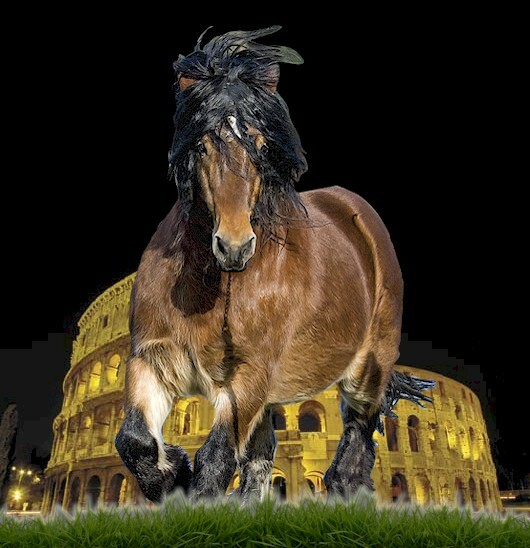 They have also been used to influence or create several other horse breeds throughout Europe and Asia. Ardennes horses are heavy-boned with thick legs. They are known for good-temper, stamina, and are strong.. Ardennes horses are found in many colors, although black horses are very rare and are not allowed to be registered with the breed registry.